Mayan Caves Expedition unique experience in The Yucatan Peninsula, this tour departure from Cancun and The Riviera Maya. Become one of the first visiting this incredible place! This adventure is led by a guide expert in nature that will make this experience unique. An adventure in the Mayan jungle where we will visit a couple of caves with beautiful stalactites and stalagmites. A spectacular and beautiful place that has been kept pristine and untouched since pre-Columbian times. Here we will unveil the secrets of the Mayan ceremonies. We will see ancient offerings and astonishing Mayan paintings. We will have a truly organic Mayan lunch in a Mayan-cooperative where they grow everything on the menu. 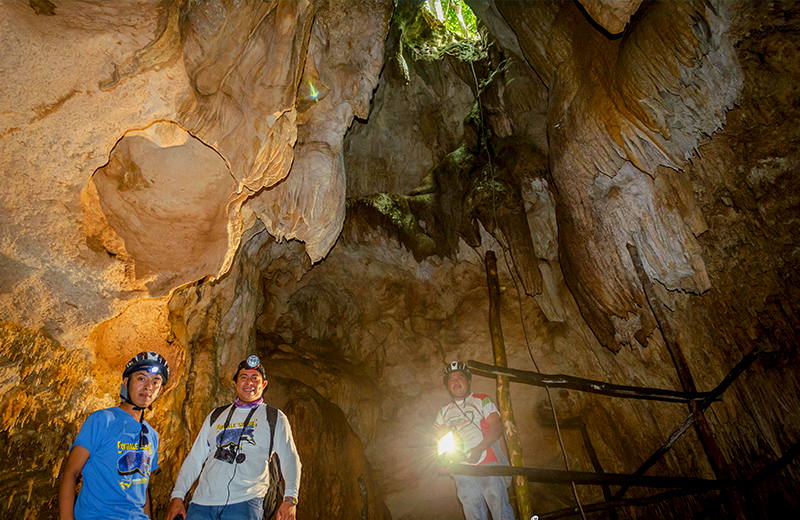 Ideal tour for those travelers looking for a different tour, where they will get a better understanding of the Importance of the underground caves and cenotes for the ancient Mayan people. It will be an incredible day, don’t miss this unique adventure Book now. 09:00 am Hike inside the cave “Xibalba door”. 10:00 am Walk inside the “Cave of offerings and paintings”. 11:00 am Swimming in the “Chac Mool cenote”. 01:00 pm Lunch in an Organic Restaurant. 03:30 pm arrival at your hotel. Cancellations with 48 hours before, no charge. No shows 100% cost.